House finches are active but nervous birds. Their antics are fun to watch; however, unlike a parrot that can be held, a finch is not the right bird to have if the owner wants one that's loveable and playful. Finches don't enjoy cuddling -- although they're playful among themselves -- and holding them causes these birds stress. They make nests in pockets placed in the cage, and this is where finches will raise their young. Occasionally, when a parent dies or is unable to care for the baby, human intervention is needed. Though the babies are fragile, it is possible to raise them by hand until they can be introduced to other finches. Find a box or cage that will protect the baby finch and give easy access to feed and care for it. Ensure the baby cannot escape before it's old enough to be placed in a cage with older finches. Make a nest in the corner of the cage or box. It can be made of fleece or flannel fabric, and should have sides high enough so the baby cannot roll out of it. Cover the area for the baby finch with a folded paper towel. Place the cage with the baby finch where the heat can be regulated. The baby must not get too hot or too cold. The temperature should be regulated between 88 and 92 degrees F. A heat lamp above the cage works well, as does a heating pad under it. Put a thermometer in the cage between the nest and the wall of the cage. It will need to be continuously watched and the heat adjusted, until a steady temperature is finally achieved. Purchase a ready-made seed mixture from a pet-supply or feed-supply store and a bottle of Pedialyte. Set up a schedule for feeding the baby finch around the clock at timed intervals. Watch the crop in the baby's neck, as this tells when the baby's hungry; if it is flat, or puffed out, the baby finch is hungry and needs to be fed. Mix the ready-made seed with the Pedialyte so that it's watery. Feed the baby finch by filling an eyedropper with the ready-made seed mix. A syringe used to give human babies medicine will also work. Give the baby a little at a time, allowing the baby to take the food at its own pace. Baby finches do not breathe when they are feeding. Feed the baby small amounts at a time, allowing it to breathe in between. Do not overfeed the baby, as this could cause death. Change the paper towel in the baby finch's nest before placing the baby back in it. The baby will probably fall fast asleep. Mash up small bugs, occasionally mixing them with the seed mixture and sufficient quantities of water after the first two weeks of just feeding the seed mixture. Keep feeding the baby finch at regular intervals. Bugs provide perfect protein to keep the growing bird healthy. It's also okay at this point to start giving the baby water, small drops at a time, separate from the food -- although it's also okay to continue with Pedialyte. Replace the homemade bird nest in the box with an actual finch nest, purchased from a pet store, in a cage. The baby finch is strong enough at this stage when it can stick its head out of the nest to let the caregiver know it's hungry. No matter what kind of directions a person is given for raising a baby bird, however, the chances of it surviving are slim if it is newly hatched. Remember though that even if it does not survive, it was held by your loving hands that tried. Provide crushed birdseed in a bowl that attaches to the inside of the cage, along with a water container. At three weeks, the baby is large and agile enough to jump from the opening of the nest to the bowls and is now actively feeding and watering itself. It's okay to leave the baby in this cage for its lifetime. Put the baby finch at five weeks of age into a cage with other finches. It is now old enough to be accepted and not picked on by the others. Keep its cage as it was for the time being, in case there are problems and it needs to be moved back into its first cage. It's okay to introduce another finch to the baby in the baby's cage as well. Keep the baby finch's bedding clean at all times, replacing the paper towel as often as needed. 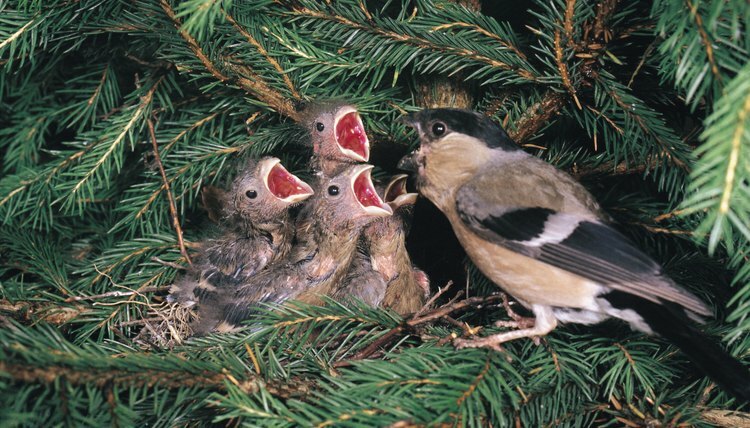 Keep sudden noises to a minimum, as baby birds startle easily. Keep the cage and the baby in an area not accessible by children or other pets. Do not overheat or underheat the baby finch, and do not force or over feed it -- as all of these conditions can cause the death of the baby finch.